A new report from London-based think-tank Carbon Tracker has concluded that 54% of all EU coal plants are currently loss-making, a number which will increase to 97% by 2030 and that a total phase-out of coal by 2030 could stem utility losses by up to €22 billion ($26 billion). The new report published this week by Carbon Tracker, Lignite of the living dead: Below 2°C scenario and strategy analysis for EU coal power investors, set out to establish a scenario for the 28 Member States of the European Union of how a transition which is compliant with limiting the rise of global warming to below 2°C would impact the valuation of the region’s coal-fired power plants. Carbon Tracker developed an “asset-level model” which determines a retirement schedule and explains the financial implications for investors. Confidence in European coal-heavy utilities is increasing in recent times following years of significant losses. German energy companies RWE and Uniper have recently seen their share prices increase by 64% and 79% respectively in 2017, reflecting increasing confidence. But the future reality of coal does not bear out this confidence continuing for long, and should already be impacting current events if not for a widespread head-in-the-sand mentality to the role of coal in the future energy mix. According to Carbon Tracker, falling renewable energy costs, air pollution regulations, and rising carbon prices will continue to undermine the economics of coal power in the EU, potentially making generation assets unusable by 2030. Specifically, Lignite of the living dead reveals that 54% of coal is already cashflow-negative today, a number which will only increase to 97% by 2030 which would make the coal industry reliant on lobbying to secure capacity market payments — a process the European Commission is looking to prohibit by 2025 — and avoid air pollution regulations. 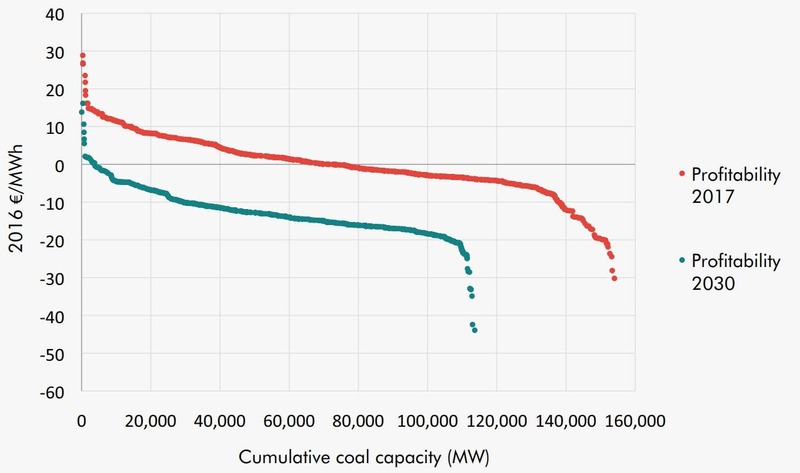 Further, from a purely market-based perspective, the levelized cost of electricity (LCoE) for coal-fired power plants could be (and is likely to be) higher than the LCoE of onshore wind by 2024, and solar PV by 2027 — a prediction which, in this author’s humble opinion, is severely underestimating the likely price declines for both renewable technologies. The final cost of these findings is revealed in the claim that the European Union could avoid €22 billion ($26 billion) in losses by phasing out coal power in line with the Paris Agreement, rather than letting it maintain its current stranglehold on the European energy mix. RWE and Uniper — which are currently experiencing a modicum of success — could avoid losses of €5.3 billion and €1.7 billion respectively if they move to close coal-fired power plants before 2030, a move which could cut losses for all of Europe’s 15 largest coal plant operators (except for Italy’s Enel and Romania’s CE Oltenia). Unfortunately, the common-sense argument presented by Carbon Tracker — alongside the common-sense argument presented by the decreasing costs of renewable energy sources like onshore and offshore wind, and solar PV — will not necessarily be enough to change the minds of coal-reliant energy utilities. Lignite of the living dead explains that there are many reasons why utilities may keep their coal plants running at a loss, such as hopes that governments might line up to make capacity payments for guaranteed power supply (similar to the proposal recently made by US Energy Secretary Rick Perry) or pay them to retire their plants; hopes that their competitors will close their own plants, resulting in higher power prices; fear of the clean-up costs of retiring their own coal plants; and political opposition to coal-plant closures by governments for political reasons. However, when you compare these to the expected stricter European Union air quality standards and the growing investor push for climate risk disclosure, utilities will need to decide between further investing in already unprofitable coal plants, or cutting their losses. Specifically, the new air quality standards will require 70% of EU coal plants to install expensive new technologies to meet the standards — a cost that many utilities may simply be unwilling to suffer. Rising carbon prices could also increase costs for coal-reliant energy utilities, and the European Commission has also proposed banning coal from receiving capacity market payments by 2025 which might undermine the chances of new support from EU Member States. In the end it feels as if it would be a hard sell for utilities to justify keeping their coal plants open in the long-term — but as we’ve seen countless times over the past decades, common sense doesn’t always come into play for utilities striving to make as much profit as possible.